Who doesn’t enjoy a great trip? You’ve just clicked the final button to book the vacation you have pictured in your head for so long, or the city trip you desperately wanted to do ever since you saw its sights in your favorite movie … granted sometimes it is out of a family obligation but the bottom line is: this time it’s different. This time you have a little human being who’s going to travel with you, a task not to be underestimated. It doesn’t matter whether you have a small baby or an energetic toddler with you. The ground principles are the same and I will let you in on the best tips I have for the families I work with, on how to enjoy their time away from home with their whole family. The risk we all run when undertaking a project, such as travelling is that we get carried away by wanting to do too much. That response is what I hear a lot but truth be told, unless you have a newborn who is great at shutting down when there is overstimulation, that tactic will wear off after a couple of days. 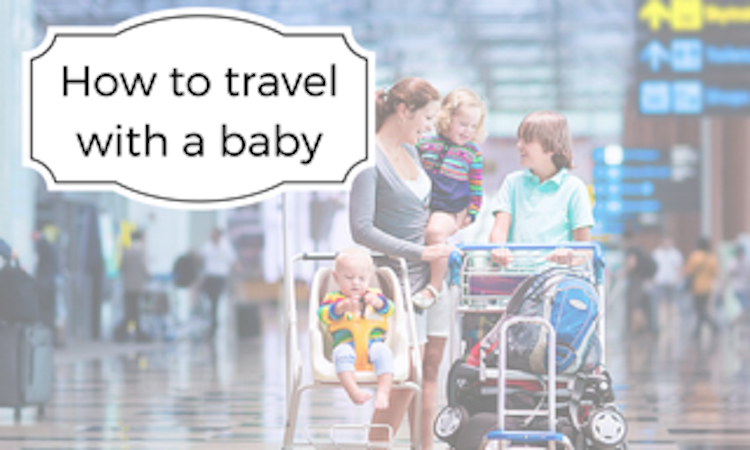 So here are some tips on how to travel with a baby, which means without a cranky monster-child on your heels! #1 Don’t overplan! Everything will take more time than you expect. So drastically reduce what you have planned, especially in a city. There are so many new impressions to digest that your little one, in particular when not used to city life, will be very easily overstimulated and much more tired than before. So make sure you can take a break. The best scenario is of course to go back to your place and have a proper nap time but I do understand that that is not always possible. So what can you do? #2 If you have a small baby invest in a great baby carrier. Preferable one that isn’t too stiff, which leaves the baby enough room to have a nicely rounded back and legs in a frog like position. Do not turn your baby outwards. Always have her face you. It is just way too overstimulating to do otherwise and you are not doing your tiny one a favour. YOu can simply chuck the carrier underneath the stroller and whenever it gets too busy too your baby is having a hard time to shut down, switch to the carrier which should make this much easier on her. Even bigger children love to be carried in a carrier on their parent’s backs and if you have a good carried they aren’t heavier than a backpack and they can also have a great nap in there. #3 When travelling by plane for a long distance flight, it is better to travel by day. Yes, you might land with a cranky gremlin at the end because naptime was not as successful as usual but if you travel at night and your little one isn’t sleeping you have missed naps plus a night and you can scrap your child of the floor and go from meltdown from meltdown. #4 When crossing time zones and you are severely jet lagged, work with daylight. Make sure you spend lots of time outside during the day and your child’s inner clock will re-adjust much quicker. Children usually have a much easier time to get acclimatized than adults do. Also try to keep your child’s daily nap rhythm as much as possible. If you need help to figure out how to travel with a baby, please don’t hesitate to reach out. I’d love to help. About the author: Today’s guest post was brought to you by Christine Hansen, International Certified Paediatric Sleep Consultant and International Adult Sleep Coach. When she’s not teaching people how to sleep better, she enjoys time with her husband, daughter and two dogs and attending concerts. She has provided this free gift to help babies sleep better without tears to our readers: sleeplikeababy.lu/familytravelsonabudget. Wow what amazing tips! I’m a huge travel fanatic and it’s really important to me to still be able to travel once I have kids, so these tips are beyond useful. It’s great to hear you confirm that traveling during the day is better, because that’s what I would have thought but it’s nice to have it confirmed. I think not overplanning is by far the most important piece of advice, even if you don’t have children overplanning can only end is disaster, exhaustion or frustration. Not only will it ensure that you have downtime, but you also won’t get disappointed if you don’t complete everything on the “list.” Such great tips, thanks so much for sharing! Great point about over scheduling. I think that’s one of the easiest ways to ruin a vacation. I recommend picking 2 or 3 things per day to do and if you have energy and time, add in another. Slowing down to enjoy the experience is key — and so hard to do in our over scheduled, fast paced world.